I have been so super busy this month creating wonderful holiday projects that I can't wait to share with you. However since most of them are holiday gifts for family members that read this blog we are simply going to consider December my maternity leave (ya know I never took a solid one of those!!) LOL! Anyway, I am still of course loving on my design team projects and hope you are following along over on Facebook which always seems to be active. Well anyway today is of course my Day to post for Just For Fun Stamps and I have such a fun card to share with you. 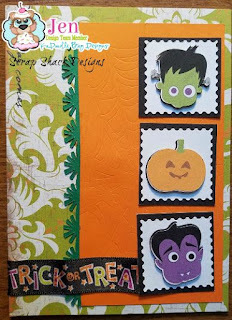 Here have a look at the super fun stamptangle image!! Don't you love these stamps?!! If your interested in the details make sure to head on over to the JFF blog. Today I have a really fun card that not only features a fancy fold at the bottom but also features a beautiful scene. So to start his card I cut a piece of paper 6.5" by 8.5" which when folded will give you a card that measures 6.5" x standard 4.25." I then took the bottom and folded it up at 1" creating not only a flap but your standard A2 card measuring 4.25" x 5.5." The reason I folded the bottom was so I could layer the Whimsy Village stamp on two different levels creating the clustered look of the village. Once I had the card folded the way I wanted I took some distressed inks in two different blue colors and sponged the background. Once my ink was laid down, darker color on the top and edges, I took a white gel pen to create "Stars." Once the background was the way I liked it I then folded up the card and added white glitter paper to the bottom two layers, thus creating glistening snow. As for the village I ended up stamping the Whimsy Village stamp set multiple times onto white cardstock. I then fussy cut out 3-4 of these images and adhered them (only gluing the bottom of the village) and layered them onto the two flaps. 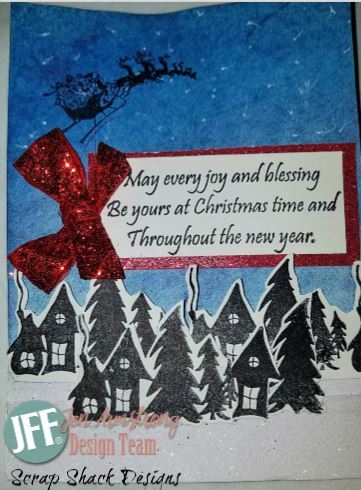 I then stamped the On Dasher... stamp set in black ink onto the top of my card. You could also choose to leave a circle die on the background when sponging and this will create a moon on your background. Once that was completed I decided to stamp and layer the May Every Joy... stamp as my sentiment. Then I create a bow and attached it all to the card. Thanks so much for checking out my project today. Make sure to come on over and join our "Any Occasion" challenge this month and I'll see you there. I love the Fall season and everything that comes with it, including the wonderful holiday season! Today I wanted to show you an awesome card using a beautiful fall stamp called "Harvest Bundle." I chose to keep this card simple because the image was so lovely and I did not want it to get lost in the design. After I stamped the image with a "Desert Sand" colored ink I decided to color it in using the ever so subtle watercolor pencils. Watercolor pencils are excellent for anyone new to coloring because you really can't make a mistake with them. While I am still newish at coloring I have found that if you outline the image with the colored pencil and then take your blending pen and drag the color to the rest of the image you get some amazing, and super easy, shading effects. After I had the image colored in I layered it onto some orange pattern paper. I then tied some twine around the length of the card and added a "thanks" which I simply cut out onto white paper using my Cricut. 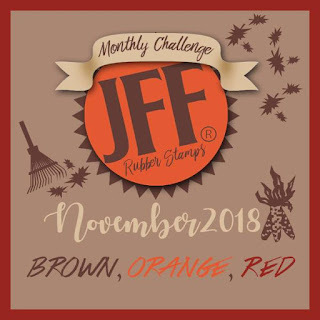 Thanks for stopping by today and make sure to join us in our monthly challenge using the colors Red, Orange, and Brown. Today I am bringing you the last of the Christmas Envelopes and of course these two also use the "No Peeking Reindeer" file from KaDoodle Bug Designs which means that you should have been able to create 6+ card designs simply by purchasing this one file. I filled all of the envelopes with goodies from my stash. I also had some new stamps that I never used and I figured I would pay it forward. This was a really fun project to create and I hope my swap partner enjoys them as much as I do. Of course, even though I took some time away from the blog I did not stop crafting, and today I am here to show you some more of those fabulous Christmas Envelopes that I made for my 25 days of Christmas Countdown swap. 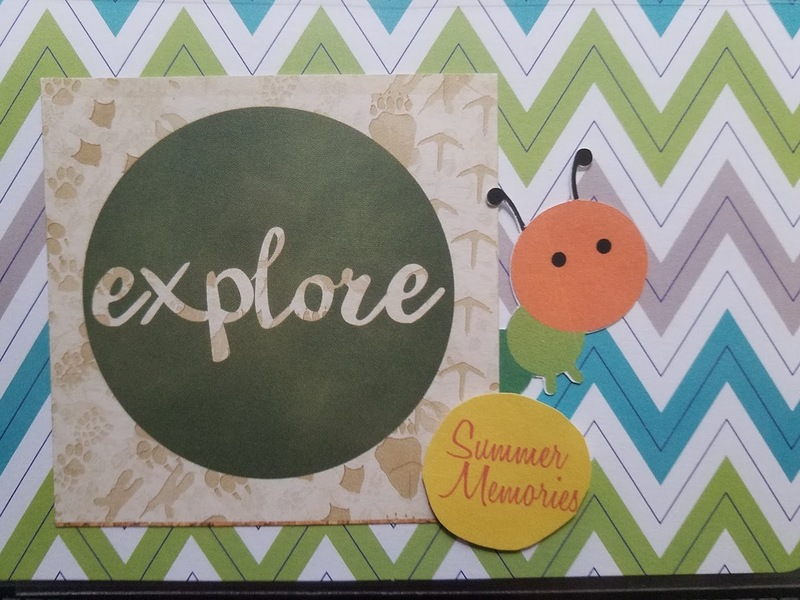 In order to add more value to the easy print and cut feature I set my printer to vivid, use a heavy weight cardstock, and "accessorize" the image prior to adding it to the project. In this case I took a white gel pen and highlighted some parts of the image. I also decided to use some shimmery glitter to add some interest and of course I added googly eyes..simply because I couldn't resist. 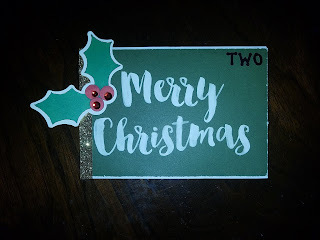 So I recently signed up for a fun 25 days of Christmas countdown where a craft partner and I get together and swap envelopes that are decorated fancy and filled with goodies. 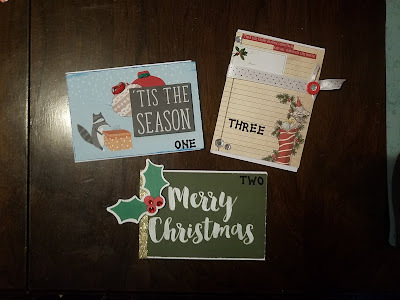 I thought this was a really fun swap and a great holiday pick me up so here we are envelopes 1, 2, and 3. You can get fancy and make your own envelopes or you can use envelopes that you have on hand. I found a package of white envelopes that measured 5.5" x 4" which is just a tad smaller than an A2 card so I decided to use those. If you are creating cards instead of envelopes (project works equally well with both) then you can use some simple white card bases. Below I have a picture of what my holiday stash looked like at the beginning. It was a little scary looking so I ventured to Hobby Lobby and I picked up a couple more things, they were having a sale so I spent about $10 on accessories. I ended up with new paper, ribbon, 3 packages of stickers, glitter paper, and two small punches, which helped the stash grow a little. Ok so with all my new, and old, goodies in hand I decided to start working. 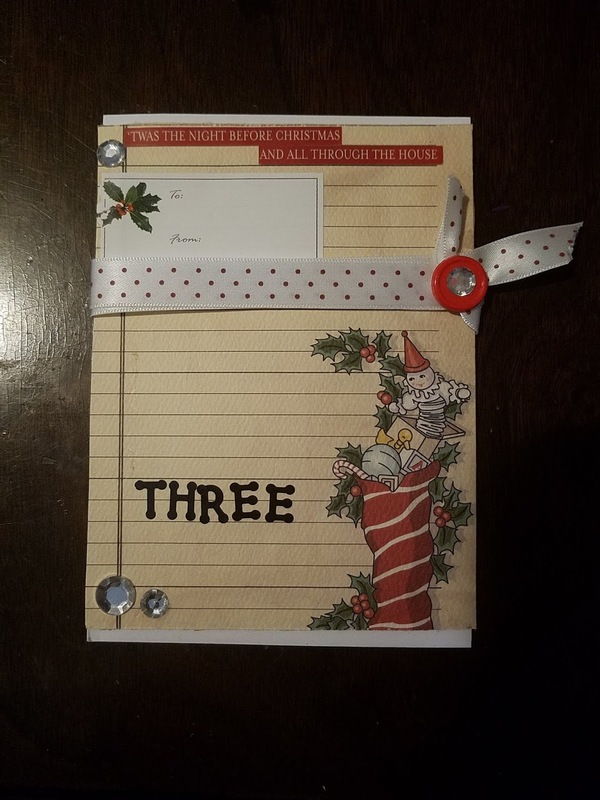 Today I am going to show you designs 1-3 which were all made using a pocket card and some simple embellishments. For number one I cut out some paper ornaments (from another pocket card) and tied some twine around the top of them. I then inked blue around the edges of my base pocket card. 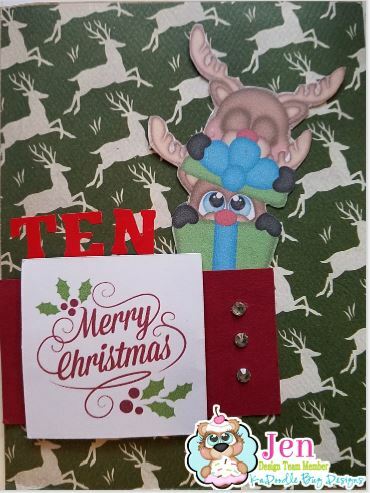 The "tis the season" came from the same pocket card that the ornaments came from and are all just fussy cut out and adhered on. The pre-printed racoon image on the base card made this design come together really fast. I then finished it off by adding "one" with alpha letters, if your not gifting these as an advent and are making cards instead then you can omit this part. Number two is yet another simple design. 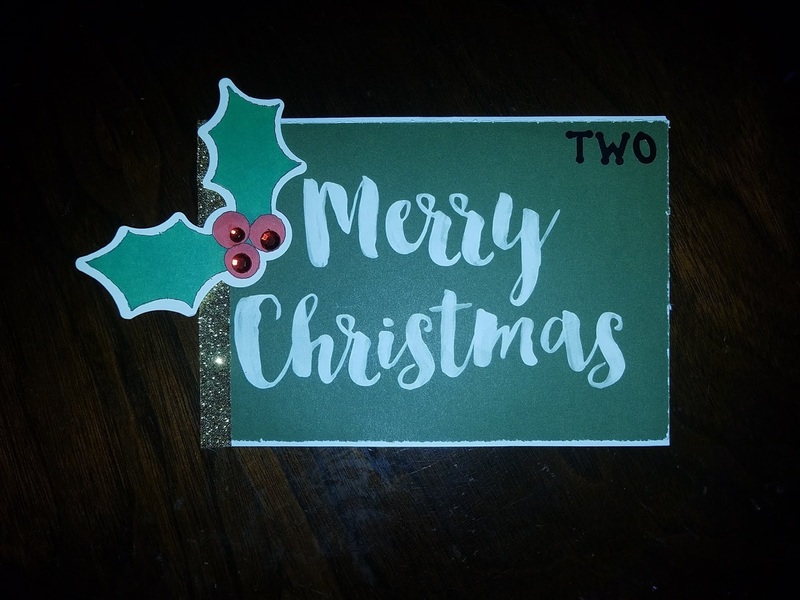 The "Merry Christmas" is a pocket card cut down to fit the envelope. I then added some gold glitter trim tape from CTMH and a holly berry die cut I had in my stash. To finish the card I added three red gems and of course notice that this is my second envelope gift. Number three is the most detailed one of the bunch. This one, like the others, started off with a base pocket card...who can deny that adorable stocking image. I decided to stick a to/from holiday tag sticker and some holiday lyrics to the top of the design which helped balance the image. The fun part about this is the polka dotted ribbon from CTMH which actually acts as tie to keep the envelope shut. I then went ahead and added some gems. If you enjoyed this post make sure to catch the other 25 days of Christmas countdown. Numbers 4-6 can be found here. As always feel free to share with a crafty friend and thanks for stopping by. Thanks for stopping by today. As you already know I simply LOVE Halloween and with it being this weekend I figured why not post another wonderful Halloween Just for Fun card. If you have not stopped by the shop to check out all of the beautiful Holiday stamps that Just For Fun offers then head on over there right now, I promise I will wait for you to return. 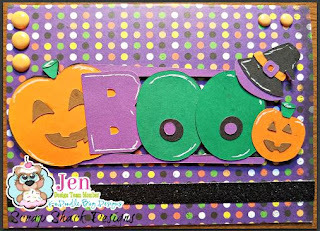 This wonderful and very square card uses one of the JFF cubed Halloween Stamps which was colored in using watercolor pencils. I used a lot of layers on this card including the distressed purple layer and the wonderful designer series paper from Echo Park. The stamped image was layered onto a gold doily to create more focus and allow the smaller sized stamp to stand out against a larger background. So I have recently realized that life gets pretty hectic when you have more than one schedule and since I now maintain five and a half (hey the dog counts too right!) I have decided to keep this fun little planner and of course with a fun planner comes some fun planner accessories. These super fun accessories were made using the Boy Pumpkin Skull cut file from KaDoodle Bug Designs. It was fun to take one image and create multiple accessories with it, plus using the print and cut feature made it super simple. The paper clips are so addicting, I mean easy to make. 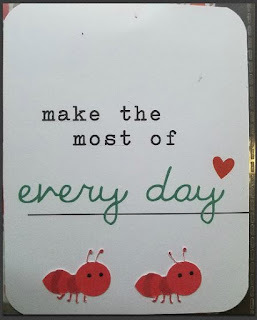 I simply take the image/die cut and attach a glue dot to the back, then to polish it off I add a small circle die cut. 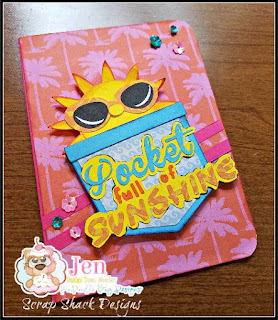 The "note pad" is just an image printed and cut out onto white cardstock, using the Cricut, then a matching matted orange piece. Thanks so much for stopping by today. Let me know below if you create your own planner goodies. It's brand new to me, so curious minds want to know, drop me a link to your creations. This fun card started out as an original pre-printed pocket card which I simply adhered two pieces of pattern paper onto and then accessorized. The whole accessory pieces was inspired by the wonderful white picket fence die cuts that I received as part of a swap...is that not the best die cut ever? Of course I had to get this cute little KaDoodle Bug critter onto the card. This guy is called "Spider and the Hat" and can be found on sale here @ the KDB store. I cut him out as a print and cut and then my oldest and I decided nothing says spooky spider more than some glitter so away we went glittering the web. Halloween is one of my favorite holidays so of course I had to go all out and make a wonderful Halloween card to celebrate the occasion. This card was easy to put together using the Moonlit Witch Silhouette stamp set and some paper from Echo Park and the Paper Studio. 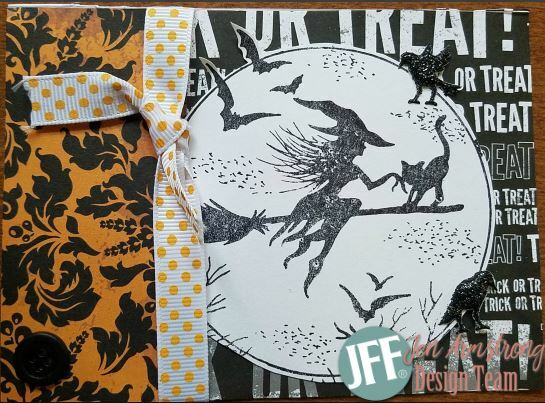 I love the silhouette stamps that Just For Fun offers because they are so simple to use and add such a statement to your cards. This image was stamped onto white cardstock using a black ink. It could have easily been embossed and looked just as spectacular. I layered my pattern paper behind it and then tied off some ribbon to cover the seam. As always I finished the card off by adding some accessories from my stash, including the crows and the button. Thanks for stopping by today. I hope you enjoyed my project. Halloween is right around the corner and with a new baby album in the works along with our family album I decided that I could never have enough layouts pre-designed for this busy upcoming holiday season. Today's post starts the season off right and offers a wonderful and easy to duplicate single page Halloween layout perfect for capturing all of those photos. 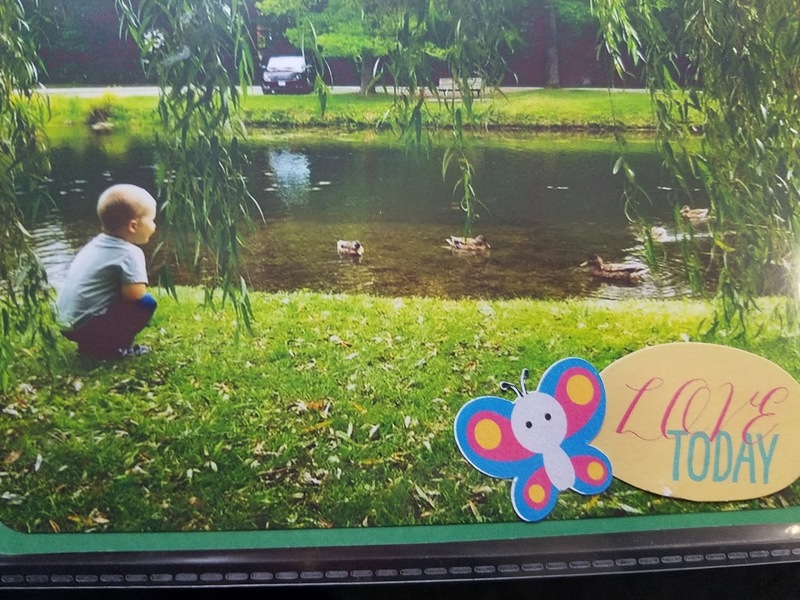 The inspiration for this layout came from Pinterest and I fell in love with the idea of having a photo mat for each of my kids. 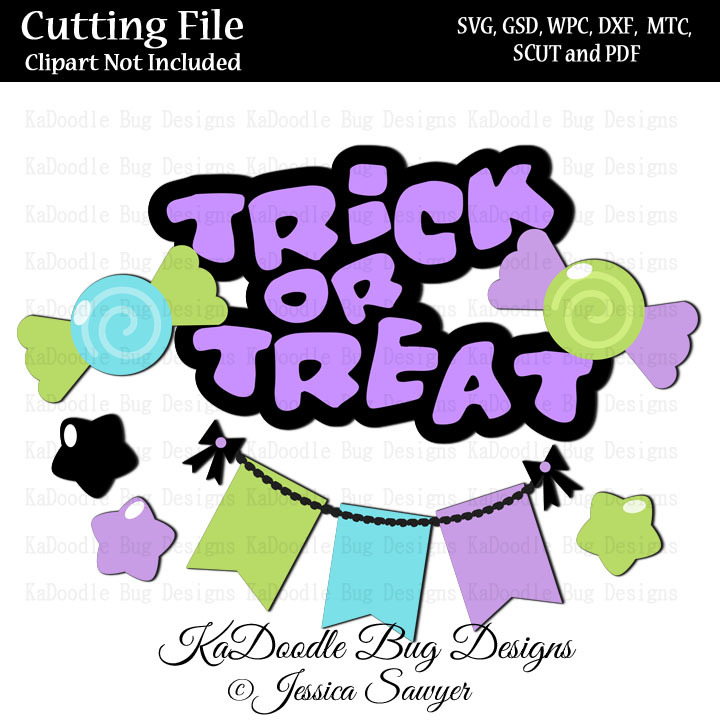 I used the Trick or Treat file from KaDoodle Bug Designs along with paper from a retired CTMH pack and The Paper Studio's All Seasons paper pack. This whole layout was created in Design Space and all of the pieces were cut out using the print and cut feature. Honestly I was not sure if I was going to like the P&C feature on a layout, but it turns out that paired up with some foam tape the print and cut feature can really stand out. Here is the complete file if you are interested in purchasing it. As you can see in the layout I took those candies and separated them from the title in order to make my journal square, down in the bottom. I attached and printed out two for the bottom border and then I added an additional one up in the corner, of course popped up with 3-D tape. It's always fun to have the ability to take pieces of the file an add them as additional accents, you never have to worry about it matching. The banner was another really fun part to this file. I simply print and cut out multiples and then adhered them together to form a longer banner that fit across all three photo spots. Layering was a key piece of both this layout and the cut file so I continued to layer and left the black background of the title. 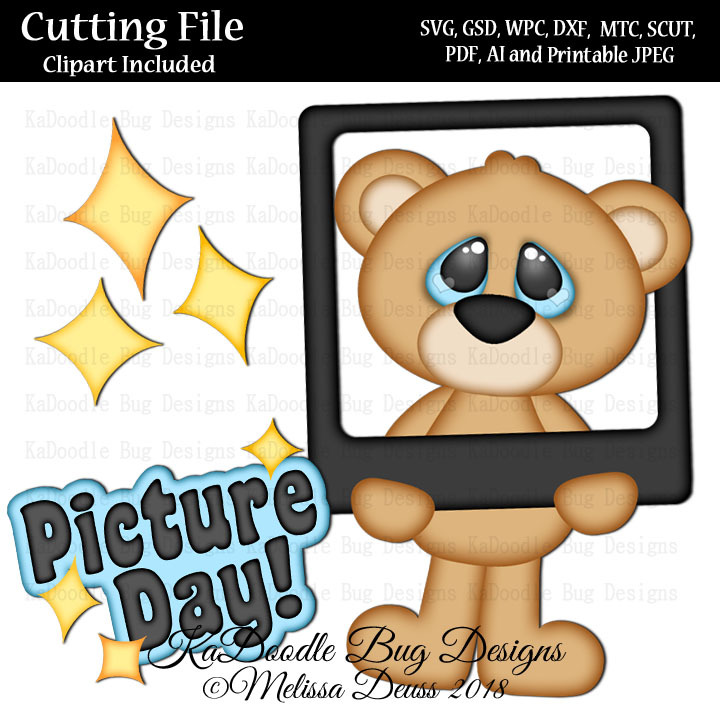 Today is my day to design for KaDoodle Bug Designs and I found this super cute "Picture Day Bear" file that I knew would be perfect for Doodles 2nd grade pictures so I grabbed my school themed paper and I got to work. I love this layout design because it has a larger place for the class photo and then a smaller mat for Doodle's individual photo. The file is also completely adorable, I mean who can resist that bear. If you are interested in checking out this file you can find it here on the KDB website. The file is perfect for layouts because it comes with that bear as the focal image, but then it also has that wonderful title and some really cute star accessories. Here is what the complete file looks like. Along with the cute file I decided to use paper from The Paper Studio's All Seasons paper pack. This is often my go to paper pack when I am looking for holiday themed paper. Along with the DSP I accented in yellow and black solid paper and then of course I tied it all together using CTMH's Blue Burlap Ribbon. Thanks for stopping by today I hope you were inspired to create something wonderful. 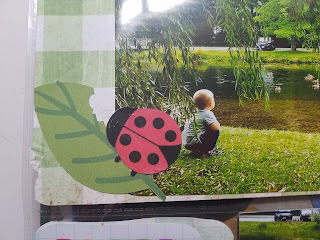 Since the new baby has arrived I have been trying my hardest to keep up to date with my scrapbooking and memory keeping, today's post will hopefully show you a really quick and easy way to get some of those photos captured, printed, and in those albums. This layout celebrates the last day that I was a mom of 2 and therefore is a very special memory that I would love to cherish forever and ever so it was important for me to get it captured and documented before life got too far ahead of me. The layout above was created using pocket cards from my stash which paired nicely with the Little Buggies file from KaDoodle Bug Designs. 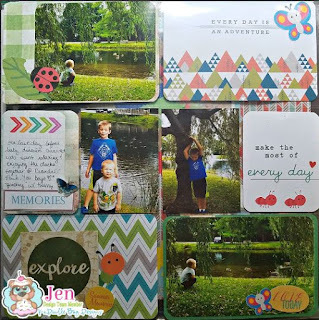 To keep this layout simple I decided to use the print and cut feature on the cut files and to print the photos right at home. Here are some closer views of the homemade cards. The additional embellishments were just pieces that I found in my stash box that fit the layout theme. I kept the layout simple because I really wanted to focus on the memories and the pictures. This is my middle boy, wild-man, who thought quacking back at the ducks was the best thing ever. 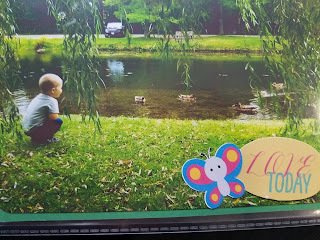 This was his first time seeing the ducks so it was really a memorable and super exciting day. I used a combination of pattern paper and pre-made pocket cards for the layout. All of the critters come from the KaDoodle Bug file, keeping the layout uniform. I love this card so much and it really fit in with the memory so I had to include it. I kept the cards simple and just added some Ants from the file to the bottom of this one. I made sure to add some of the images to the photo pockets as well which helped to make the layout cohesive and together. All in all this layout came together in about an hour, which isn't bad since most of the card have very hand-made elements. I hope this inspires you to capture your memories. Thanks for stopping by today. Thanks for stopping in today as I share another wonderful Halloween Card using the super fun Happy Halloween file from KaDoodle Bug Designs. If you missed my project earlier this week then you can check it out here, I use the exact same cut file and create a totally different card. I like to call this card my triple square Halloween card and had a super fun time making it. First things first that spectacular green paper is from Echo Park's Halloween line and I adore this whole line as well as this piece, which is actually left over from last year...yep still using it. Layered onto the pattern DSP paper is a small green border which was cut out using CTMH's Artbooking cartridge. This is a super fun cartridge and has a ton of themed elements in it, like over 1,000!! Yes it's totally worth checking out and purchasing before they retire it. The embossed spider web, look closely on that orange paper, is also from that same cartridge. 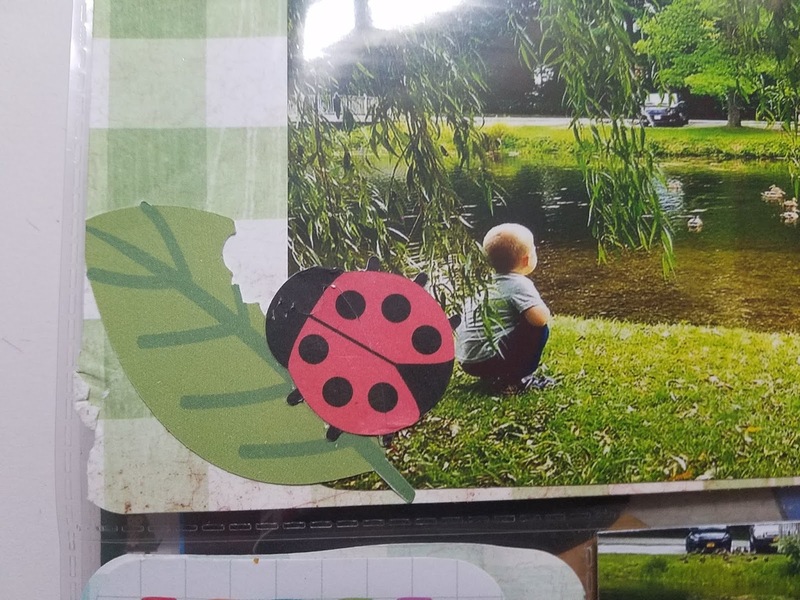 If you are not familiar with using DS you may not know that you can switch any image from cutting to embossing, or even printing, by clicking the box next to the image. It's super simple you just insert the image then click on those scissors and choose your output. ...see my image below and contact me if you have any questions. Once I had the base of the card completed I then started working on the squares. I cut a black layer and the white layer out using my Cricut. This made it super simple and ensured that my edges were even and that all squares were equal. 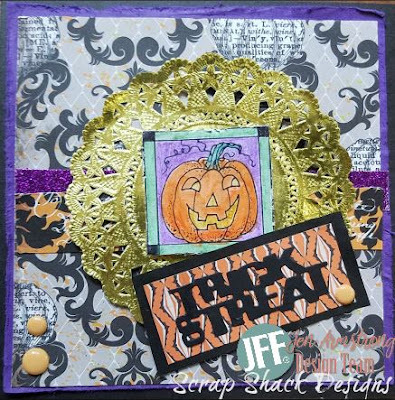 I then layered a piece of Halloween ribbon across the bottom, this was in my stash and just added to the fun card. 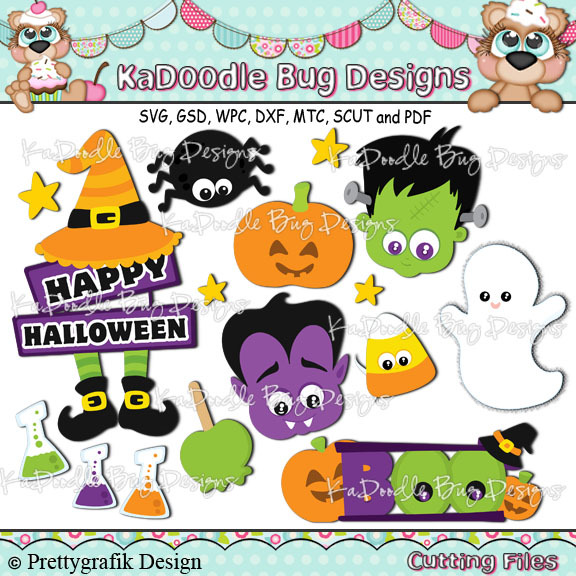 As far as those images go, they again are from the lovely Happy Halloween file from KaDoodle Bug Designs. This set is full of wonderful Halloween elements, check them out below then follow the link to purchase them on sale. There you have it, as promised earlier this week, another really awesome way to use that Halloween file. Thanks for stopping by today. As we get further into the Fall season my heart gets more and more excited about Halloween! It's such a fun holiday I mean who complains about costumes, candy, and of course all things spooky. 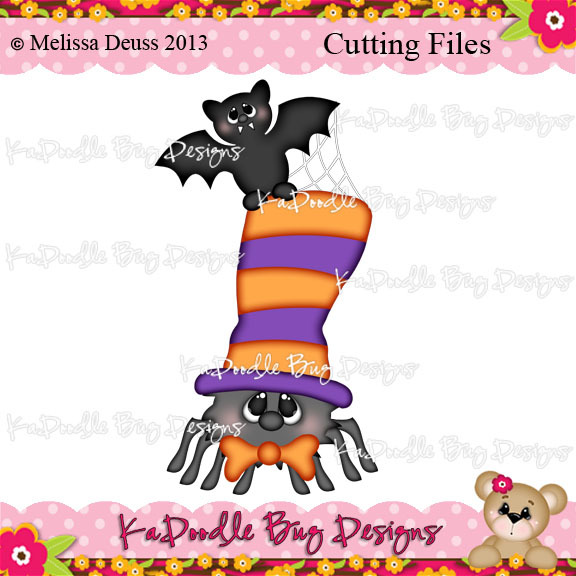 Today's project is a card that features the Happy Halloween cut file from KaDoodle Bug Designs. This file is excellent for layouts, pocket cards, of course greeting cards, and really all things paper. I decided to keep it simple and to make a fun Halloween card that my boys could pass out to friends and family. This file features multiple components which can be used alone or grouped together. Here are all of the pieces. Since there are so many great files grouped together in this one you will see my come back to this same file for upcoming projects so make sure you subscribe via email (right over in the side bar) so that you don't miss out. I love files where you can get more bang for your buck...don't you?! After I had the complete file cut out I layered it onto some Halloween paper, which came from The Paper Studio's All Seasons paper pack. I then decided to embellish it a little with a white gel pen and some retired "Cat & Bat" dots from CTMH. Oh yea and of course I added some black shimmer trim across the bottom, this is also from CTMH and is wonderful paired with the dots on any of your Halloween projects. 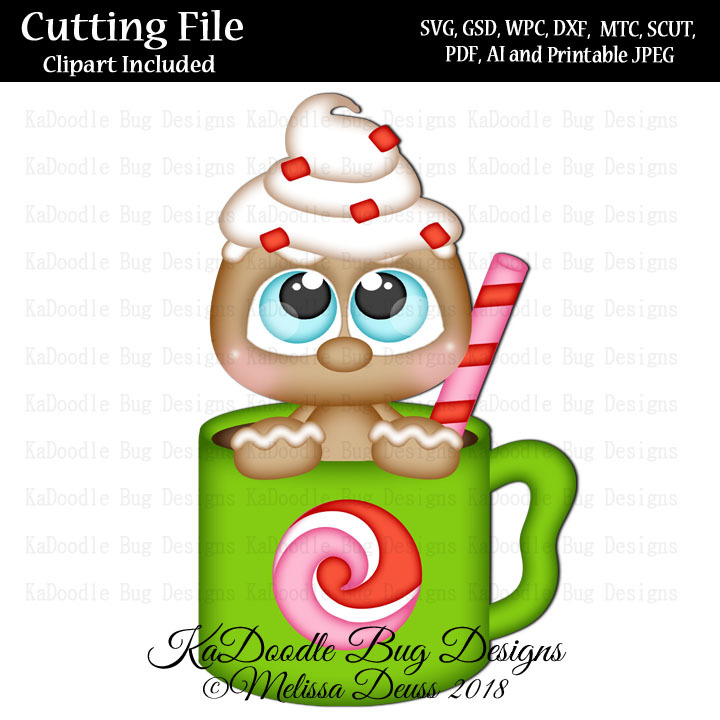 Thanks for stopping by today and make sure to head on over to KaDoodle Bug Designs and pick up that file so you can create along side me. 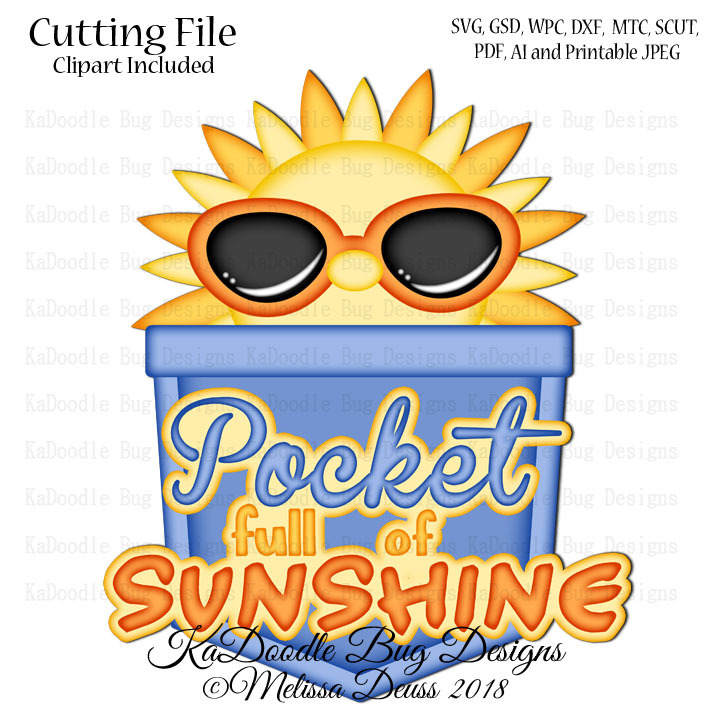 Today I wanted to show you another way to use the KaDoodle Bug Designs "Pocket Full of Sunshine" file, you know in a way that brightens someone's day but doesn't necessarily have to be used in the summer time. This card was very easy to create and since the die cut was cut out so large it was easy to glue together (yes even those small letters.) I used a couple of pieces of pattern paper for the inside pocket and the sunglasses/sunshine layer. The die cut was popped up using 3-D foam tape, my go-to! I kept the background of the card fairly simply adding a piece of pattern paper along with two strips of matching solid pink cardstock. I think these diagonal lines are super cute and really help to draw the eye. down to the sentiment. 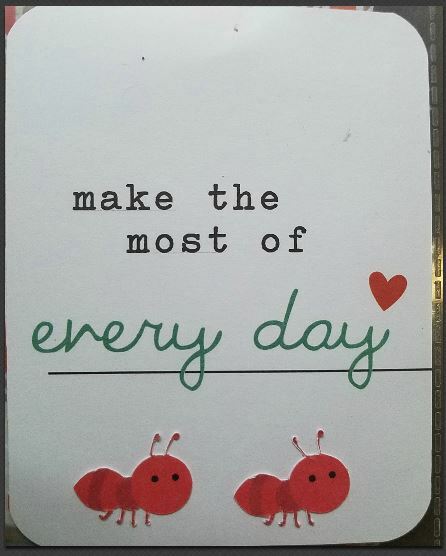 Wouldn't this card cheer you up on any gloomy day?! The inside carries that pink palm tree paper as the background and a piece of pink solid cardstock so you can add your sentiment. Here's a closer view of the cut file. Just click on the image and it will bring you to the KDB online store...while there, don't forget to check out the freebies. 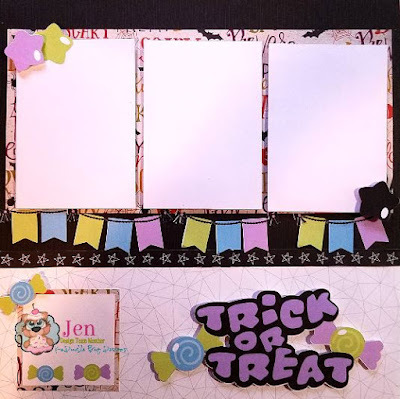 If you missed the first post where I used this same file in a Pocket Scrapbooking layout then make sure to check it out here. Hey guys, it's Jen here with a really simple card that you can recreate using any of our Just For Fun landscaping stamps (or really any stamp for that matter.) Today's card is simple yet layered making it somewhat elegant with a touch of masculine. JFF has a ton of excellent landscaping stamps and this one is no exception. 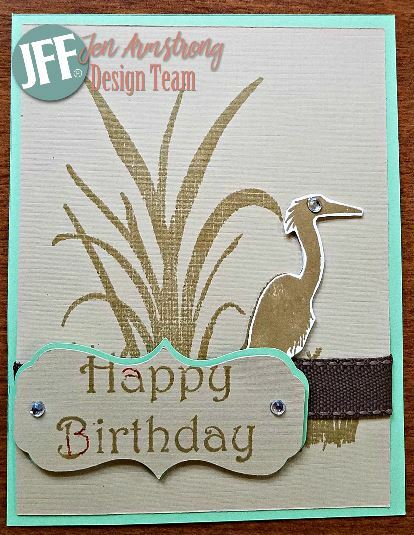 This stamp is called Great Heron Silhouette and was perfect for this design. I started by picking two neutral toned colors, in this case a Sage and a tan, making this card perfect for males and females. I then used an ink that was a few shades darker than the tan paper. Once I had the image stamped onto the front of the card I layered on a brown ribbon along with some stacked labels. 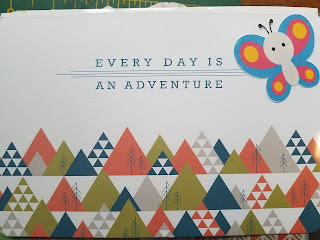 I then finished the card by stamping a "Happy Birthday" sentiment, JFF has a number of excellent ones to choose from, and then adding some diamond gems from my stash. Of course I layered the entire card front onto some more sage green paper making this card quick, easy, and wonderful. Thanks for stopping by today. I hope you were inspired to create something wonderful.